This 4/20, Get Carried Away presents our new event concept "When Worlds Collide," an immersive experience celebrating everything you love about Brooklyn. 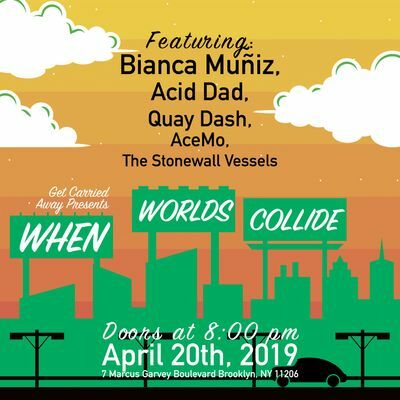 We'll be partying in a cavernous, 10k-square-foot former bank, highlighting diverse musicians from multiple genres - rock, R&B, rap, electronic - and local & national vendors that believe in Brooklyn's placement as a cultural bedrock in the US. This year, your 4/20 plans came early. Doors at 8:30pm. Tickets are only $20 - prices go up March 1st.